for fast evaluation of innovative ideas. → Guiding Principles help a venture stay on course, keep going, and make better and faster decisions. Weighted Guiding Principles enable a strategic leader to make an effective strategic decision within a minute or so. First and foremost, you must develop effective idea evaluation criteria. → Brainstorm a broad list of criteria by which you wish to evaluate innovative ideas or any proposed new course of action for your business. Your corporate → vision, → competitive strategies and guiding principles will help you streamline this brainstorming session. Having generated a lot of criteria, select 20 most important ones. Then narrow this list down to 5 or 10 by combining sister criteria or deleting weaker ones. Having finalized the list of criteria, weight them according to their importance to your business. To evaluate an idea, rate how well it meets each criterion. The highest rating of 10 would indicate the idea perfectly meets that criterion. A rating of 0 would indicate the idea does not meet that criterion in any way whatsoever. Generally, scores of 80% or higher indicate the idea is very valuable and worth taking further. Now, you have an easy-to-use and very effective strategic tool for idea evaluation. → Communicate it to your people. 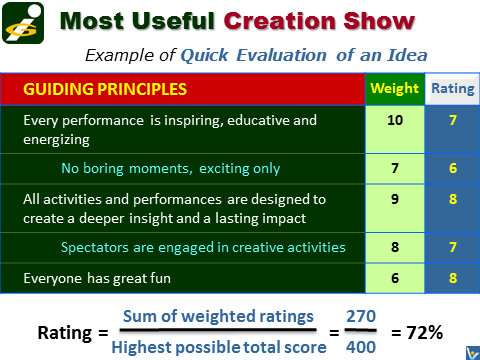 Everybody in your organization should know what criteria are used for evaluation of innovative ideas. → Creative thinkers should also be able to evaluate their ideas themselves before submitting them to decision makers. This will make the idea generation process more focused and increase the quality of ideas submitted to decision makers for evaluation. The whole idea management process will become much leaner. It will be easier to get gold out of the sand as there will be less sand and more gold in it.